Your logo is printed in full-color sublimation on a Brushed Aluminum Metal Badge with up to 3 lines of digital personalization. Each badge is individually poly bagged. You can order as few as 5! Your logo is screen printed on our Brass Name Badges and your employee names and/or titles are engraved into the metal and then blackened for contrast. 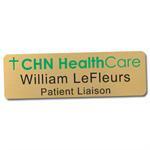 Make your own custom metal name badges...in a snap!